What an amazing race! I guess everyone interested in the Kona results has heard of Crowie’s and Chrissie’s great wins by now – so I’ll keep my regular look at race results pretty short. The conditions in Hawaii were the best that I have seen in the last years (my data goes back to 2005). The race adjustment was calculated at 2:09, resulting in a new course rating of –0:25. These are also the names of the people who will probably think that they had a great race. Others were closer to their expected times (Andreas Raelert, Timo Bracht, Faris, Tom Lowe) were probably hoping for a little bit better results, even if they managed to finish in the top spots. This goes to show that you can’t have a "ho-hum race” and still expect to finish in the TOP 10 for IM Hawaii. There is a similar “green color scheme” for the top spots on the women’s side. The exception is Chrissie Wellington who was few minutes slower than expected – but she still had to uncork a special performance to win the race after the beating she took from a bike accident just 10 days before the race. 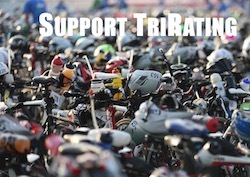 How many people have completed 12 IMs and will now be able to get a slot for Ironman Hawaii?